Forest elephant populations in one of Central Africa's largest and most important preserves have declined between 78 percent and 81 percent because of poaching, a new Duke University-led study finds. "Our research suggests that more than 25,000 elephants in Gabon's Minkébé National Park may have been killed for their ivory between 2004 and 2014," said John Poulsen, assistant professor of tropical ecology at Duke's Nicholas School of the Environment. "With nearly half of Central Africa's estimated 100,000 forest elephants thought to live in Gabon, the loss of 25,000 elephants from this key sanctuary is a considerable setback for the preservation of the species," he said. 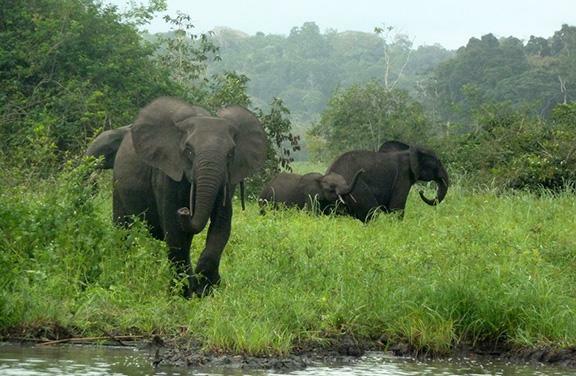 This is a small group of forest elephants in Gabon's Minkébé National Park. Poaching for the illegal ivory trade has reduced their numbers by 80 percent, according to a new study. While some of the poaching originated from within Gabon, findings from the new study indicate that cross-border poaching by hunters from neighboring nations -- chiefly Cameroon to the north -- largely drove the precipitous decline. Poulsen and his colleagues published their peer-reviewed findings Feb. 20 in the journal Current Biology. They estimated the extent of the population losses by comparing data from two large-scale surveys of elephant dung in Minkébé National Park from 2004 and 2014, using two different analytic methods to account for periods of heavy rainfall that might speed the dung's decay and skew the surveys' accuracy. "Based on changes in the abundance and geographic distribution of the dung, we identified two fronts of poaching pressure," Poulsen said. "Elephant numbers in the south of the park, which is 58 kilometers from the nearest major Gabonese road, have been somewhat reduced," he said. "By comparison, the central and northern parts of the park -- which, at one point, are just 6.1 kilometers from Cameroon's national road -- have been emptied." The proximity of this road makes it relatively easy for Cameroonese poachers to access the park and transport their illegal haul back to their nation's largest city, Douala, a major hub of the international ivory trade. Since 2011, the Gabonese government has taken major steps to curb poaching in Minkébé, Poulsen noted. Among other things, they have elevated forest elephants' conservation status to "fully protected," created a National Park Police force, doubled the national park agency's budget, and become the first African nation to burn all confiscated ivory. 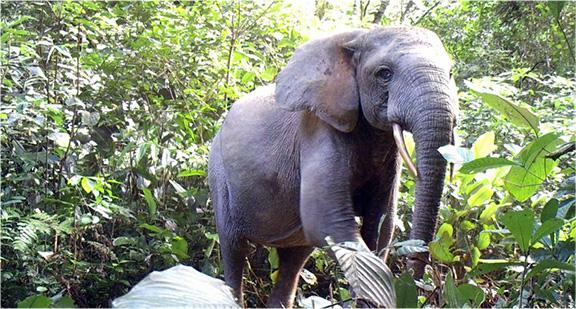 This is a lone forest elephant in Gabon's Minkébé National Park. From 2004 to 2014, an estimated 25,000 elephants in the park were killed for the illegal ivory trade. These efforts are laudable and may be reducing poaching from within Gabon, Poulsen said, but the new research suggests they have done little to slow the illegal cross-border traffic. "The clock is ticking," he said. "To save Central Africa's forest elephants, we need to create new multinational protected areas and coordinate international law enforcement to ensure the prosecution of foreign nationals who commit or encourage wildlife crimes in other countries," he said. "Studies showing sharp declines in forest elephant populations are nothing new," he said, "but a 78 to 81 percent loss in a single decade from one of the largest, most remote protected areas in Central Africa is a startling warning that no place is safe from poaching." Researchers from the National Parks Agency of Gabon, the University of South Florida, the Max Planck Institute for Ornithology, the World Wildlife Fund Central Africa Regional Program Office, Gabon's Institute for Tropical Ecology Research, and the University of Stirling conducted the study with Poulsen. Duke-affiliated co-authors were Connie Clark, Amelia Meier, Cooper Rosin, Sarah Moore, Sally Koerner and Vincent Medjibe. The 2004 and 2014 surveys used in the new study were funded by four agencies: the U.S. Fish and Wildlife Service, the World Wildlife Fund, the Wildlife Conservation Society, and the Convention on the International Trade in Endangered Species of Wild Fauna and Flora's Monitoring the Illegal Killing of Elephants program.